Heirloom Quality Instruments: Built for Sound, Durability and Repairability. Hand voiced and tuned for a sophistication of sound that you won’t outgrow. Santa Cruz Guitars are built in strict climate control for stability. They are crafted with the experience of professional repair technicians for easy maintenance and to ensure successful future restoration. Reclamation, Sustainable Yield and Responsible Harvesting. Downed trees, sunken logs, old tenements, building beams, master carpenter inventories… We find the most resonant, best-sounding wood possible by responsible means. Tonal qualities improve with age due to the resins that crystallize once the wood is removed from a living tree. We use this secret to enable our new guitars to possess a legitimate vintage sound from the start. Hand Voicing for Balance, Tap Tuning for Complexity. Most modern guitars are assembled from pre-shaped parts which possess random frequencies that can cancel out overtones and limit sustain. No wonder you have to search for “the good one.” We are employing the techniques of master violin luthiers to voice and tune by hand manipulating the dimensions of the top and bracing. This creates consistent harmony, sustain and sophistication of complex tone on every instrument we build. Sonically Superior to a Bolt-On Neck or We Wouldn’t Take the Time to Do It. The dovetail jointed neck allows us a considerable degree of control over the presence of the guitar. The tonal advantage of the dovetail is not a matter of opinion; it is supported by acoustic physics. The dovetail joint is a crucial element in voicing and tuning our guitars to be extremely responsive and powerful to the audience. The simplicity of our design facilitates undetectable removal for neck angle resetting or replacement due to trauma. Our dovetail design is the proven product of generations of master violin luthiers. Our durability comes from intelligent engineering, not extra weight. SCGC incorporates the engineering principles of parabolic and radiused bracings, giving each instrument additional power, resonance and durability. This gives them multiple times the strength at a fraction of the weight. Our first instruments are in their fourth decade of professional use, proving the soundness of SCGC’s ‘light but strong’ designs. Nitro-cellulose is the best finish for steel stringed instruments, period, which is why we spend the extra time and effort over cost efficient factory finishes. Cellulose IS wood, and by using it as the solids for our lacquer, we are putting a thin coat of wood on wood, enhancing resonance and ensuring restoration quality repairs. Modern factory finishes are like glass: nice looking, but if broken, your instrument is aesthetically compromised. If your guitar cannot be repaired; it is disposable. Nitro-Cellulose lacquer insures heirloom quality and superior sound. We are Luthiers, Not CNC Guitar Kit Assemblers. We are not restricted by the constraints of manufacturing efficiencies from building something personal and unique. We are truly a custom shop, and pride ourselves on the ability to hand make any aspect of the guitar to meet the design and acoustic preferences of our customers and dealers. Our only limits are physics and good taste. At this modest number, we procure the top 1% of tonewoods and the world’s most passionate team of luthiers. Expertise and mastery can only be earned through practice, and our luthiers’ combined experience spans over a century. 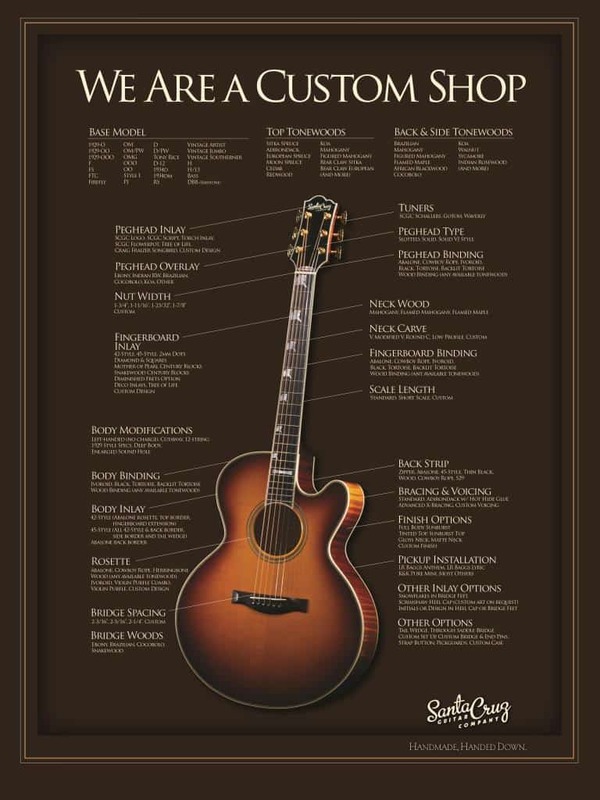 This solid foundation has enabled our guitar makers to become the best in the world at their specialties. Santa Cruz Guitar Company combines the timeless heritage of violin lutherie with a working camaraderie and ongoing symbiosis with some of the world’s top experts in acoustic science. Being a small shop enables us to handle everything personally, from our world class repair service to our friendly, dependable office staff. Our dedication to the livelihood of your guitar lasts as long as our warranty service: a lifetime. We allow you direct access to our in-house professional repair and restoration experts for timely service and technical advice. Richard Hoover, our founding luthier and internationally recognized authority on the acoustic guitar, is at your service for expert consultation on SCGC models, custom design and acoustic references.